Sunflowers are a traditional favorite that never go out of style. Of all flowers, sunflowers are often the best representation of warm, summer days. These hardy, cheerful flowers are easy to grow and maintain. At the end of the flower’s growth cycle, some gardeners even harvest the seeds to create a healthy, homemade treat. 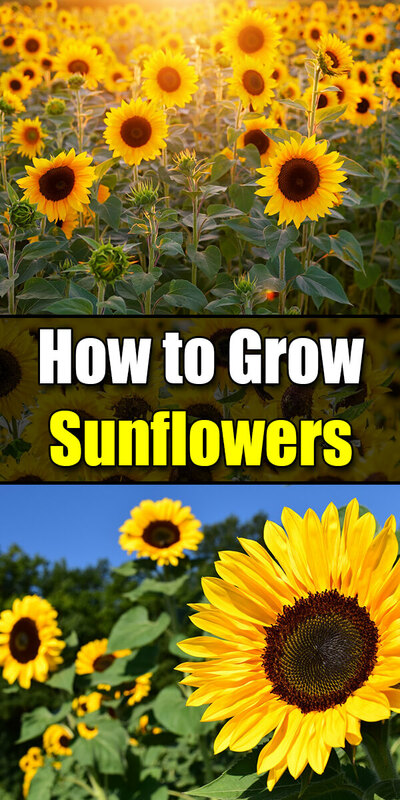 Whether a long-time gardener or brand new flower enthusiast, consider some of these simple tips and facts for growing healthy and happy sunflowers. Unlike other varieties of flowers, sunflowers don’t require any major soil alterations. Even relatively dry and arid soil is often fine for Annual Sunflowers (“Helianthus annuus”). However, to give your flowers extra nourishment, add some homemade compost or organic mulch to lock-in additional nutrition as your seeds sprout. Use at least 2-3 inches to help prevent weeds and conserve water. Always plant your seeds in a garden section with access to full sunlight. This ensures they receive the needed warmth and light to flourish throughout their growing cycle. Sunflowers are known as “drought-tolerant annuals.” This simply refers to their ability to thrive even when water is scarce. Healthy sunflowers flourish with about 1-2 inches of water per week. Consider using ice cubes or a self-watering system that allows you to set the desired amount of moisture. Because sunflowers prefer well-drained soil, double check that there isn’t too much clay or moisture-holding material present. Plant your sunflower seeds after the last frost of the season. Your soil should be fully defrosted with no threat of sudden “cold snaps.” Insert your seeds at least 1 inch deep with each one 4 inches apart to prevent crowding. To extend the flowering period of your sunflower crop, continue to sow seeds throughout the summer every 10-14 days. This allows you to nurture a larger crop with continual blooms. Sunflower seeds sprout at 7 to 10 days and bloom at around day 27-30. Healthy annual sunflowers often reach heights of 1 to 2 feet with large blooms. Because of their size, be sure the flowers are well-anchored with a small stake or similar support. Sunflowers are famous for their tasty seeds. Birds, in particular, love to steal seeds as the flowers reach maturity. If you plan to harvest the seeds, cover the blooms with small plastic bags or use reflective tinsel to discourage birds from landing on them. Banded sunflower moths, cutworms, and seed weevils are among the most prevalent sunflowers pests. These insects prey on the leaves, petals, and seed casings, creating noticeable damage over time. Always monitor your flowers closely and act quickly if these pests appear present. Using pesticides and homemade bug sprays to prevent infestations. Although sunflowers are usually very strong, naturally-healthy plants, some struggle with cases of mildew or fungus, particularly in tropical or sub-tropical climates. Sunflowers grown in overly-hot, humid climates are subject to too much soil moisture. Their leaves may develop large brown or white spots and begin withering. Combat these issues by eliminating excess moisture and using a well-drained soil variety. Try Autumn Beauty Sunflowers in your garden this year. This strain is a well known, heirloom Sunflower that’s great for beginners. The seeds produce blooms in rustic shades or orange, yellow and burgundy and grow to a height of 5 to 8 feet tall.